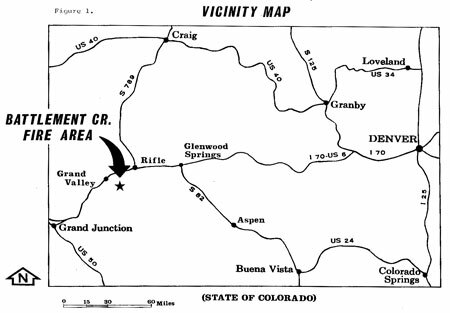 This investigation report covers an accident which occurred July 17, 1976, in the Grand Junction District of the Bureau of Land Management (BLM) in Colorado. Three firefighters were killed and a fourth severely burned while working on the Battlement Creek fire approximately 40 miles northeast of Grand Junction, Colorado (fig. 1). All victims were members of a trained Forest Service (FS) fire crew stationed at Mormon Lake on the Coconino National Forest near Flagstaff, Arizona. The fourth victim, although severely burned, is expected to recover fully. He is John C. Gibson, 27, of Wellsville, New York. The accident occurred during a burnout operation along a ridge above the fire in a steep drainage. The crew did not recognize the danger they were in until their planned primary escape route was cut off by a run of the fire from below them. This report will discuss in depth the multiple factors which contributed to this unfortunate accident. Although unrelated to the Mormon Lake crew fatalities, another death occurred on the Battlement Creek fire when a B-26 air tanker crashed and burned on July 16, killing the pilot. This accident is reported in a separate report. Western Colorado is experiencing an unusually severe fire season caused partly by unusual fuel conditions and heavy lightning activity during dry weather. A severe frost on June 14, 1976, killed a high percentage of the leaves on Gambel's oak, which is now a readily available and dry fine fuel. The District has also experienced a greater number of fire starts, which has taxed their fire control capability in the past few weeks. Under a national plan to exchange and utilize manpower and equipment, the Forest Service crew was working on this Bureau of Land Management fire. There were also people from the Forest Service in supervisory positions. The Director of the Bureau of Land Management and Chief of the Forest Service appointed an interagency investigation team under the co-chairmanship of Jack Wilson, BLM, Director of the Boise Interagency Fire Center (BIFC), and Max Peterson, Deputy Chief for Programs and Legislation of the Forest Service (FS). Other team members were: Clyde O'Dell, Boise (Idaho) BIFC Fire Weather Meteorologist, National Weather Service; Ed Heilman, Director of Fire Management, Northern Region, Forest Service; Robert Mutch, Research Forester (Fire Behavior and Fuels), Northern Forest Fire Laboratory, Forest Service; James Abbott, Fire Training and Safety Specialist, Washington Office, Forest Service; and Harold Baer, Attorney, Solicitor's Office, Department of Interior, Denver. Instructions to the team through the co-chairmen were to determine the conditions and circumstances that led to the fatalities and injury on the Battlement Creek fire.